You make a very valid point regarding the public face of alienation being the suffering of parents and grandparents, who have lost contact with their children and grandchildren. That is one of the reasons it is so hard to get alienation taken seriously, we expect adults to carry their suffering, afterall we must all put the children’s need before our own. BUT as you say it is not best for the children, it is not what they need or in their best interrests. Indeed behind every story of a child rejecting a parent is a story of child abuse and that needs recognising. However, working out who is the abusive parent, is it the one who has been rejected, the one the children are aligning themselves with or a bit of both, is a very difficult job and requires someone with special skills in interviewing and talking to children, not an undertrained cafcass officer, bar reporter or curator. Thank you Kat. Parents and grandparents are often ground down by the (mostly legal) process and by the sometimes very hurtful things children say in this situation, and sometimes they’re advised to give up. As you may know, there’s evidence to show that the children themselves, when they grow up, say they expected the rejected parent to know better, that is; to know despite what they were saying, that they were merely mouthing the words and performing the behaviours but never wanted that parent to give up on them. If there was more awareness of this, and what their adult voices say about their plight, the public face of the issue might be transformed, and attention focused on the children. A child rejecting a parent is indeed a remarkable disturbance that should not be ignored. Even when children have really suffered at the hands of a parent they almost always want to maintain a relationship with both, and in those circumstances a great deal of effort is often expended to enable them to do that safely. If there’s any chance of risk or abuse then it must be given absolute priority; with thorough assessment and careful management. However, in cases where there are no indications or even suggestions of the more commonly seen forms of physical or sexual abuse, that “remarkable disturbance” may not be recognised without the special skills you refer to, and then the more subtle but still evident signs don’t get picked up either. Identifying those “evident signs” at an early stage may be one of the keys to improving the lives of these children. As you say, that requires training and in some cases follow up services to enable it to happen. The recent Fidler and Bala paper offers a very clear view of the issue, including examination of the roles of both parents and the mythical elements that creep into the debate. On the References page, I’ve added a link to the paper for anyone who needs it. I hope you’ll keep contributing as more posts appear on this issue. Thank you for the reference, as you say it gives a very clear view of the issues involved. very true. my ex had an issue with attachment from her childhood and her early parenting primarily driven by her mother. her fear of abandonment had already been realised in her previous marriage. i was brought up in a household where my father was constantly vilified but was the “better” parent in that his love was unconditional. the catalyst for the relationship breakdown was his death and the birth of our second son two months later. i could no longer stand the emotional buffer zone that had previously existed in our marriage. my ex loves the children dearly and in many ways is a wonderful mother. I have my flaws (modesty eh?) but what surprised me was that she was prepared to allow the children to be exposed to conflict and be used as a weapon to hurt me despite the impact upon them. its painful to face how we got to where we are. She is a children s social worker. I think for some parents its too much to ask. they are fragile and denial is a comfort zone. one thing that struck me with my ex was that she buried her emotions and feelings deeply and they rarely slipped out (expressions of emotion were frowned upon within her family particularly by males). she is not a bad person. i loved her and had two beautiful children with her. they love their mum as it should be. we make choices. we have to accept responsibility for them. The dance we led was led by me too. Like some strange journey that we are bound to repeat unless we can break the chain? there is little more that we can do other than to love our children and hope that that protects them from our relationship blueprint. the pessimist may say its unlikely post separation unless there is a “road to Damascus” for both parents. I wish i knew? Until then you are left with what politicians call “damage limitation”. A hope that love alone and fate can wrap their arms around our children. Such innocence and beauty. if we have time with them and a relationship perhaps we have something? when i was young i asked my priest. how can you get to heaven and still protect yourself from all the evil in this world? Thank you for your carefully considered comments fidel. The part you quote from this post is explored more fully in the third post in this series: “Children’s experience of a parent with an overwhelmingly strong personality”, including the points you make about how vital a parent’s unconditional love is and how the problem is passed down through the generations unless the cycle is broken. A key part of that third post is the Alan Rappoport paper (can be downloaded from the link provided). Part of the reason for writing in more detail on this subject has been to provide pointers that might lead to a “road to Damascus“. For example: to illustrate for alienated parents that the behaviours they often believe are directly (even exclusively) targeted on them, are experienced even more powerfully by the children; and that their own patterns of behaviour are a fundamental part of the issue too, even if sometimes in a rather benign way. Perhaps most important of all is to highlight to the adults – even though it’s very painful to be comprehensively rejected in this way – that their own experience does not come close to the pain these children suffer. The point you make: “if we have time with them and a relationship perhaps we have something” is so much more than many alienated children have and need. Even when that’s denied them, it’s critical that the alienated parents (and families) continue to demonstrate that unconditional love and support by what they do; because in this situation actions speak louder than the words they repeatedly hear from the aligned parent. So making clear that they’re always available; will always love them; will never give up on them; and are focussed on their interests and not on putting down the aligned parent are much more powerfully conveyed by what they actually do than anything they might say. I hope you’ll continue to follow and contribute to the discussion here. The point you make: “if we have time with them and a relationship perhaps we have something” is so much more than many alienated children have and need. very true and i think its important to acknowledge that alienated or partially alienated children can still have contact. i think this was highlighted in Gardners early work. Equally as Baker concludes it can happen in intact families. its a spectrum. My own situation is that i have three overnights a fortnight and bits like sports activities. i focus on that time. i know parents who have had 50/50 and have lost their children to PA. One dad i know had that and has lost his 12 year old child. i also know a dad who had two nights a fortnight and who despite the odds has always maintained a good relationship with his children who are now adults. he started off in a contact centre with a non molestation order in place. i think the key is about how you address conflict. its children’s exposure to conflict that triggers PA. in that respect the targeted parent has some control and power. this happens on two levels. the first is around their interaction with the alienating parent? its crucial to understand what makes that parent tick and where they are controlling .how can they be given the semblance of control. remember these parents are fragile and insecure. a good example is the homework analogy. what school work should our child/children do when they are with me? this gives a semblance of control but also subtly underlines the fact that the target parent is important too. for a long time my children forgot their home work , mum said do it in after school etc. i set up two homework money boxes. each night of homework gets £2 and that is doubled at the end of the month by dad. the important thing here is the outcome. a message has been sent albeit a subtle one that you are not going to stop being a parent. it is all inclusive in that it includes the other parents views. likewise with the children it allows opportunities for praise. returning to the original point the question is how do you work with the in between? for children to get to a rejection stage there is a very small window and what we do may influence that? I may lose my children yet. Complacency is not on the agenda. But in many ways neither is fear. Or less so. I could write a book about what has happened thus far. I have a friend who lost his children. Now as young adults they have made contact and although years have been lost there is a certain beauty about the pictures i have seen of them back in Ireland. Their arms around each other in a casual way, the smiles are genuine and it is like they have found an emotional home i suppose. Not true. if you have time you can do much and even if that is lost there is still a template for action. prepare for the knock at the door for example? it usually comes and when it does what better place to be than to understand that you have done all you can and beyond that holds the realisation that that in itself makes you the parent you are and one who your children are looking for when they walk to that door?. Perhaps they are looking for a place they can call their own? They would never have had that before. Yes, it’s clear some children who continue to have a relationship with the parent they don’t live with are subjected to alienating behaviour and this also happens within some intact families. That behaviour/alienation and it’s effectiveness undoubtedly forms a spectrum. I agree conflict is a very important factor; that it must be minimised and not played out in ways that directly affect the children. I’d go as far as agreeing that in some circumstances it provides the trigger for some of the things we see in the lives of alienated children, but it’s important to be clear that it’s not the fundamental cause of the alienation. Your assertion that subtle measures can be employed to reinforce the role and importance of the targeted parent is a very important one, and something worthy of much more attention. In fact there’s a real need for more resources to be made available for alienated children to access themselves and for their families to point them to. There are examples in Amy Baker’s work of how powerful these subtle measures can often be; for example where one parent ensured gifts were sent to the children though a family friend who remained in touch. Richard Warshak focuses a good deal of attention on these subtle measures too, with indications that solid reminders of the reality of the past – for example by providing photographs (or other “hard evidence”) of happy shared experiences – can make a real difference. On his web site there are sections entitled “Divorce Poison Control Center” and “Alienation Busters” which offer quite a number of simple ideas that parents have found very effective. It seems clear the most effective way to inoculate children against the effects of alienation is to help them develop good critical thinking skills; to regain control of their own thoughts and ideas, and enable them to begin to work out and decide for themselves what’s real and what’s not; what’s right for them and what’s not. 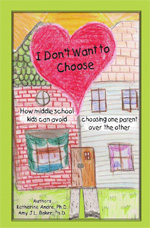 Amy Baker’s book “for middle school” children: “I Don’t Want to Choose”, is an exceptionally good starting point, but currently the only resource specifically for children. You ask what we can do to influence the situation in the often very short window of opportunity between separation and rejection. It’s something that presents a real dilemma, especially because when children approach eight years old, they become particularly susceptible to the influence of an alienating parent (though even prior to that they may be heavily influenced by older, more susceptible, siblings). The professional literature points to the need for rapid legal intervention to maintain or reinstate the relationship during the very early stages, with effective, often tough sanctions for the most determined alienating parents who’ll naturally be most likely to resist or disrupt those efforts. The answer of course is for there to be adequate education and training for the professionals who deal with those families: for the judges and lawyers and others involved, and for there to be far more caring professionals engaged in the process too. That will come, and perhaps more quickly than some might imagine, but it’s still some way off. Until then the parents (and families) themselves will have to be the “informed” ones where that’s possible and practical, although clearly and sadly those “pioneering” parents will be in the minority. This reverse and illogical process – where the parents themselves have to inform the very professionals they ought to be able to turn to for support – is not an easy one. Yet, the unacceptable nature of that situation is perhaps what may bring about change more quickly, especially if the same professionals see informed and reasonable parents making rational decisions backed by a growing body of international evidence and research. Those pioneering parents (and families) will need to steer themselves (and sometimes their professionals) along a careful path. If their approach is aggressive or adversarial (however understandable that might be) the courts may see both parties as equally difficult. If their approach is too passive (a common pitfall for caring parents) and they allow false and misleading allegations to take hold, the court may determine they are indeed “all bad” and the alienating parent may even escalate their campaign. The most effective approach is likely to be an assertive, informed and balanced one where the alienated parent is seen to be entirely reasonable and pursuing the best interests of the child(ren). Reblogged this on Tampa Family Court Victim: The War on Women. Blame the victim is too much of what I’ve received. My abusive ex was/is so skilled with psychological abuse & manipulation, it took years for me after marriage (and info I found out about not only him, but emotional abuse after marriage) to realize the trauma & training I was experiencing under his reign as my “husband.” He decided to go after a married woman with an inheritance (though I’ve since found out he was seen messing around long before this “serious” affair where he planned to leave me high & dry). I did everything I could to be a good wife, & it was extremely difficult to mentally survive, but when I actually made my own decision (something he was very much against) & beat him to the attorney (since I knew he would take advantage of his hidden income & experience in the courtroom), he became obsessed with increasing and continuing the abuse through parental alienation. The harassment continues. Meanwhile, my daughter suffers parental alienation syndrome & our entire family has been devastated, even my ex’s own mother, who was alienated from her four children when he turned the age he cut my daughter off from me: 14. You’d think the “experts” would recognize this pathology. Anyone with some wisdom or common sense would see this continuation of generational abuse & misogyny, but not the decision-makers of a precious daughter’s welfare. Thanks for your comment. I recognise the very painful exprience you describe. It can be a very steep learning curve to understand what’s gone on – and continues to go on – in the life of someone who is able to inflict this on a fellow human being, let alone on their own child. 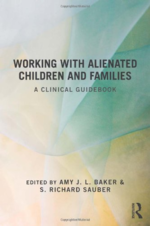 Much as it’s very important to recognise the suffering of the alienated parent, it’s also critical to ensure that focus does not overshadow the dreadful harm – and long term consequences – for the alienated child. It’s this diversion of focus onto the interests and rights of parents that so often obscures the suffering of the children – who are deprived of any genuine freedom of expression – and creates even less opportunity for the true nature of their dreadful predicament to be considered and discussed with the necessary care. You may find the third post is this series (including the important paper by Alan Rappaport) helpful in clarifying the origins of this pattern, and why it’s inter-generational. There are an increasing number of experts who understand this complex family pattern well, although they are still scarce. Finding someone with that expertise – or who is willing to learn about it – is absolutely critical to making progress in my view. 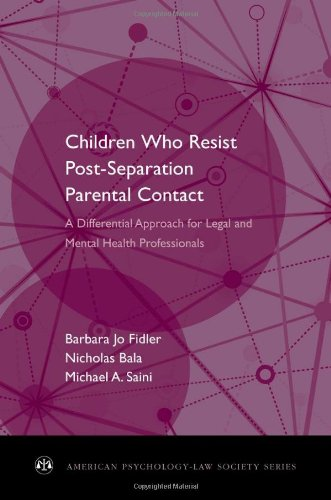 The links & references in the right hand column here – especially: “Children Resisting Post-Separation Contact” – are designed to convey the latest professional thinking and practice in the field to those professionals who may not be familiar with it. You’re absolutely right of course, in that understanding the pattern yourself is only the beginning. Conveying that understanding (and the professional basis of it’s underpinning) to others, especially decision-makers, is perhaps twice the magnitude of your original task (of understanding the pattern). Having a committed professional batting on your side is a very good place to start. Having the money to pay for an expert to come to Alabama & then counting on a caring or ethical judge — bonne chance! I think the key to motivating the system will lie in educating the public — when this subjects makes its way into literature, movies, songs & therefore the awareness & consciousness of teachers, neighbors, etc. — that’s when we’ll see real change. Just like when Harriet Tubman wrote the “fictional” “Uncle Tom’s Cabin” & the public awareness at the horrors created pressure on the legal system. There are judges who let pedophiles & rapists get away with unbelievable things. All the knowledge to the legal system will help, but it is my hope that the general public (especially the kid victims) know what is going on so healing & help is available. Thank you for your posts — I am sharing them in hopes that a teacher or someone will read them. I agree with your idea that educating the public and in particular those – like teachers – who come into regular contact with children will pay huge dividends. If and when it’s generally understood and accepted how counter-intuitive our reluctance to challenge this destructive behaviour has been, there may come a time when it’s quite simply socially unacceptable to engage in alienating behaviour. I’m glad you’re going to share these posts, because they were written to try to convey that sense of how starkly this behaviour contrasts with what we intuitively know is right for children. I have some sympathy with the judiciary, in that they’re the “last resort” option, and as such they have to try to deal as best they can with the problems no one else has been able to resolve. If very few professionals understand this issue, then the judiciary have little to guide them. The converse of that is to consider if – and how – it might be possible to enlighten the judiciary. There’s evidence (as with the Minnesota Judge’s letter in this post), that once they do understand the basics of this pattern in conflicted families, that they’re very often determined to do all they can in terms of both prevention and effective intervention. It’s important therefore to consider the situation from their point too. What most judges are looking for is who might be the parent most likely to promote an ongoing relationship between the child and the other parent, and who might be the most reasonable person – even in the face of great adversity or unfairness – as a role model for the child. How sweet of you to provide this info, thank you! Yes, I should be more hopeful & positive towards judges — just because I had one who wouldn’t even take the time to look at the stack of evidence that, to me, showed a pattern, not to mention, the character. Unfortunately, my ex has ties to the DAs office & senator, & is a skilled & obsessed manipulator. Any man who can secure 5 wives with master’s degrees & get away with the things he has can manipulate a daughter & a family court system. However, I know many can be helped by a court system once they’re educated by articles like these. I can’t help but wonder how things might’ve been different if I had known these things, but my judge & the counselor involved were not interested in this information, nor finding the truth. Thank you for reminding me there are many working for truth & the health of the child. I just pray my own daughter does not come to any more harm & that she has someone who knows about #ParentalAlienation reach out to her! I do have a few lawyers on my LinkedIn account & Facebook. I know you’re anonymous, but I can be found on LinkedIn under Donna Hickman/Public Affairs & on Facebook as FreelyLove BothParents, should you care to connect, if we aren’t already. Thank you again. I will share this resource. “Parental alienation is a given in America and Australia, it is understood throughout the family law system and extensive research is conducted on it; the cost to society both economically and in human pain and suffering is immense and it’s on the increase but still very poorly recognised in the UK. .. I work with highly complex cases in Private Law, I work under the auspices of a number of other experts, Penny for example, who in essence double check my highly evidenced assessments of attachment because accusations and undermining of the expert in these cases is common. The level of animosity, deceit, and falsehood is horrendous; we have identified very specific patterns of attachment organisation which propels the hatred and lies, intrinsic to these cases. A further complication is that it can involve the subversion of the entire system, social services and the legal professionals into the distorted world of one of the parents. In the US this is recognised as a specific danger, and the Association for Family and Conciliation Courts, the organisation I mentioned earlier, hold workshops for Judges to help them recognise this pattern. One parent presents as rational but a victim of the others violence, or, that their children have been sexually abused. The expert…me..assesses the attachment organisation of the whole family and finds that it is the supposed victim that is in fact bordering on psychopathic and has skilfully manipulated the entire Court into being on only their side. The transcript at the above link is complete (the video may stop short). 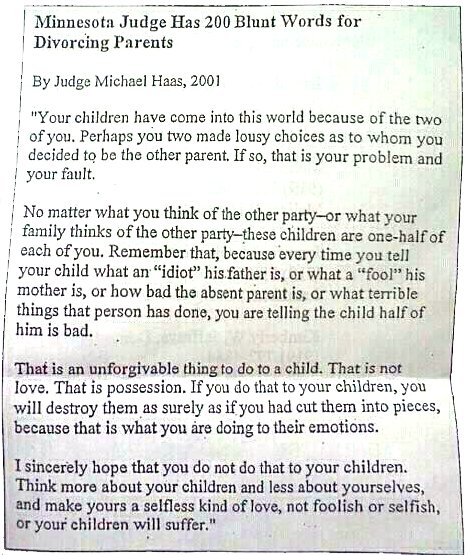 I guess you might take issue with the assertion that “Parental alienation is a given in America ..”, but the rest may resonate more. It’s certainly much more widely understood in North America than here in the UK (where it’s been virtually ignored). Melanie Gill (the speaker above) is one of the few UK members of AFCC. The organisation running the event where she gave the talk is (rather contraversially) endorsed by a significant number of UK judges. They’re probably fallable and human, and trying to do the best they can, like most of the rest of us! Thanks very much for the contact details. This is one of the most powerful post I have encountered in a long time. When I read this it was like I was reading my husbands and step daughters past few months. This post should have their names written on it. Our situation is a carbon copy of this post. Literly my step daughter went from point a to point z in less than 24 hours. One day she loved her dad then less than 24 hours latter she wanted her dad totaly out of her life. We have been suspecting something was really wrong for a few months before all this happened. My step daughter was very angery all the time, very defencive toward all mals, mean attude towards most all in our house. It was if she cut herself off emotionally from us. This post has given us a true insight into what is most likely happening to our child. Thank You for Your Post. What you say about the vulnerability of children is just as true for teens. The more difficult thing with teens is that the judge is likely to listen to them, assuming they’re not manipulated or corrupted by one parent — the parent who suddenly wants them now that he or she is able to “care” for himself or herself. The teen’s desire to be independent plays into the hands of the alienating parent who is not so much a parent as an opportunist who will take advantage of a teen seeking material gain, & possibly attention that is not necessarily healthy or appropriate. An alienating parent and a teen is a dangerous situation. How is it professionals can’t see that a teen who rebels against a parent may be doing so because that parent is the one parenting while the parent the teen aligns himself with is the parent who is sabotaging their child’s relationship by encouraging disobedience, disrespect & much worse towards the healthy, adult parent who is doing her best given a difficult situation? This leads to a no-win situation for the loving parent.